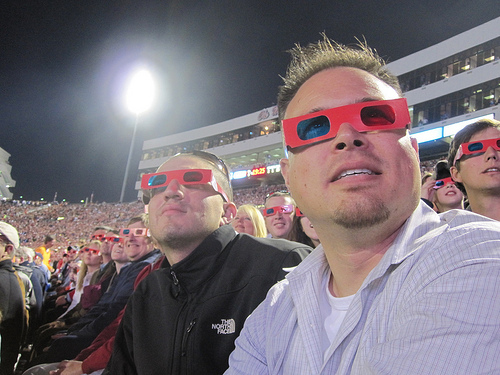 The Daily Clog » Are You Ready for Some 3D Football? To see the games, you’ll need a very pricey 3D-ready TV, meaning you can’t just sit at a bar wearing flimsy 3D glasses and expect anything to happen (although that would be extremely amusing to see). The network will be broadcasting a total of 20 regular-season games, as well as the Allstate BCS National Championship and five bowl games. If you decided against season tickets because taking BART all the way to San Francisco gives you loud-noise-induced migraines, you can now watch the Bears destroy the Trojans on your worthless 3D television and still get that headache you were trying to avoid. Remarkable things here. I’m very glad to look your post. Thanks a lot and I’m taking a look forward to contact you. Will you please drop me a e-mail? Tremendous issues here. I am very satisfied to see your article. Thank you so much and I’m taking a look forward to touch you. Will you please drop me a mail? Remarkable things here. I’m very satisfied to look your post. Thanks so much and I’m having a look forward to contact you. Will you please drop me a mail? I’ve been exploring for a little bit for any high quality articles or blog posts on this sort of space . Exploring in Yahoo I at last stumbled upon this website. Studying this information So i’m happy to convey that I have an incredibly excellent uncanny feeling I found out just what I needed. I so much surely will make sure to don?t disregard this site and give it a glance regularly. Its like you learn my mind! You seem to grasp a lot about this, such as you wrote the e book in it or something. I think that you could do with a few % to drive the message house a bit, but other than that, this is magnificent blog. An excellent read. I will definitely be back. Wow, wonderful blog structure! How long have you ever been running a blog for? you made blogging look easy. The full glance of your website is fantastic, let alone the content material!